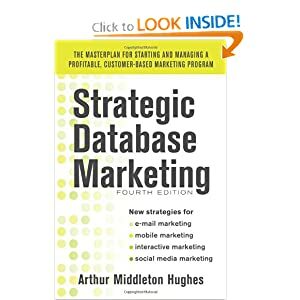 Take quizzes on the new Strategic Database Marketing 4th Edition. Click here to go to the quizzes. In the old days, companies sent the same marketing campaigns to all of their customers. Later, marketers began to understand that even simple grouping of their customers allowed them to run more relevant, effective and profitable campaigns. More recently, sophisticated marketers and retention experts – particularly in Internet companies – have discovered that applying the latest technologies to this challenge delivers far more targeted (and profitable) campaigns. Arthur Middleton Hughes founded the Institute in 1993. His books, software, seminars and published articles have enriched the e-mail and database marketing profession throughout the world. Book review: "Successful e-mail marketing strategies: from hunting to farming"
Questions about e-mail or database marketing? Contact us any time at 954-767 4558 or Arthur.hughes@dbmarketing.com. Ask anything you want to know, and you will receive a prompt answer. We want to hear from you. © 2012 Database Marketing Institute. All Rights Reserved. Sign up for entries RSS and for the comments RSS.